Hike trails by day and light fires by night beneath the Siberian skies. Grab your rucksack and head into the woods of Russia's wild-lands to the largest, deepest, and oldest lake in the world. 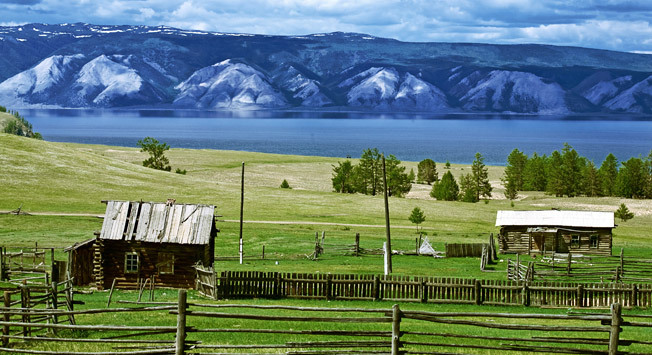 You can find Lake Baikal right in the center of Russia, but it’s easy to miss. The lake is hidden from civilization and surrounded by remote villages, long pebble beaches, and the sound of passing trains. Eco-tourism camps in Lake Baikal give you the opportunity to experience true Russian life and help safely preserve the beautiful Russian nature for future tourists and nature lovers. Whatever your age, there are plenty of reasons to take a trip to Lake Baikal. Children of all ages can come for small trips and field trips with local kids. Adults can come for trail-building and educational seminars. Interpretive programs combining the knowledge of park specialists all around the world with Lake Baikal specialists help educate tourists in the way they relate to their natural surroundings. Programs are available in both the summer and winter. There's something for everyone, anytime. The work involves serious physical exertion. In most programs, volunteers will carry their own backpacks several miles to the work site, where they'll be using heavy trail-building tools. Thus it's best suited for volunteers aged 18 to 60 years. We recommend you to bring a large backpack, sleeping bag and sleeping matt, a warm coat, strong, comfortable and waterproof boots or shoes and a drinking cup/bowl and spoon. Volunteers travel at their own expense to the established meeting place for the particular project in which they will be participating (you'll be informed of this meeting place before you depart). Prices for international volunteers start from $500 USD for the program, depending on which organization you organize your program through. This fee will cover the cost of living and working equipment provided during the program – tents, construction tools, campfire utensils for eating and cooking, first aid kits, all food and meals for the project, etc. Our company can take care of all related travel arrangements like flights, visas, transportation to the meeting place, and additional tours. To familiarize yourself with the available programs and learn more about eco tourism on Lake Baikal you can visit http://www.greatbaikaltrail.org/, a non-profit group dedicated to building the first system of environmentally sensitive trails in the region. Getting a Russian visa is a key step as you prepare for your journey. It can be challenging, as Russian Consulates have rather strict rules for visa applications. There are many companies out there who offer visa assistance. For example, if using our visa services, all you have to do is fill out a convenient online application form and wait for its approval from our visa specialists. Projects last usually 2 to 3 weeks. At the work site, volunteers sleep in tents and prepare food over a campfire together at night. Daily work entails clearing the way new trails, improving existing trails, or building a campground or other structure. Each project will include a list of specific objectives and duties. Instead of crashing in front of the TV this winter, get out to a campfire or curl up beside a ceramic stove in a yurt on Lake Baikal. Winter program projects include setting newly marked winter trails, renovating the exhibition center at the Baikal Reserve's Visitor Center, and gaining a new knowledge of Siberia and the people who live there. Young children spend usually no more than 3 hours doing group work on the trails each day before returning to the village with a team leader to engage in creative activities like painting, making crafts, molding clay, and playing interactive ecological games that educate them in a dynamic way about the environment of Lake Baikal and nurture their relationship with nature. Older groups can come to combine practical knowledge of ecology and biology with actual construction of the trail. Older participants can conduct research with team leaders and meet with scientific officials and will stay in a home-stay with a Siberian family. Volunteers also have the opportunity to visit local schools and take classes in the villages surrounding Lake Baikal to experience traditional schooling in the area and engage in eco- educational programs with locals, including a program called “The World that We Make Ourselves,” which is devoted to the protection of nature. Interpretation is a well-known practice around the world, yet here it plays a new role. Volunteers can enroll in a course and learn about the ideologies and practices of National Park specialists from around the world to learn about how and why National Park specialists do what they do and develop their relationship with nature. Work all day, relax by the campfire at night, and during the weekends or other free days enjoy hikes or trips to the Baikal Shoreline Railroad or the fabulous Baikalski National Wildlife Reserve. You can even get out to the spectacular site of the mouth of the Angara River where water empties from Lake Baikal on its long journey to the Arctic Ocean. All outings are led by crew leaders, and interpreters are readily available in each crew of volunteers to help you get more immersed in the culture. Taste the local Russian cuisine with the local inhabitants and enjoy conversations with native Russian speakers and international volunteers from all over the world. The options for cultural immersion are endless. With the onset of spring, the sun shines brightly over the Russian land, and creatures come out from hiding and the photo ops of a stunning landscape abound. The crisp winter air beneath frozen black skies in the winter months is a winter fairytale unlike anywhere else. About the author: Natalia Pakhomova is a Russian native and a chief destination expert at Travel All Russia, a destination management company specializing in Russia.